I’ve been working with a long term substitute for the past five weeks and this Friday is her last day – muy triste! 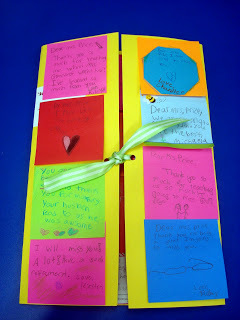 She has been amazing, so to let her know how much we appreciated her, my students and I made her a thank-you card with a recycled file folder and sticky notes (I think I had Ladybug’s sticky notes post in my mind). 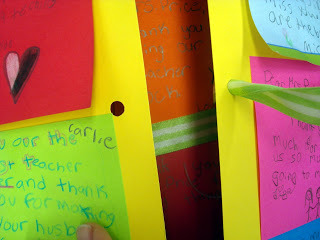 Instead of having students one by one sign a card, they were all able to write her a message at the same time with the sticky notes, and then I randomly arranged them on the file folder. 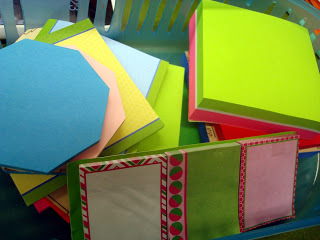 I folded the side ends of the file folder towards the middle crease like you do when you make a lapbook. I holepunched and added ribbon (recycled :)). I let students pick their sticky note (I have very trustworthy kids!). I randomly took a picture of this sticky note and didn’t realize how cute the message was until now. 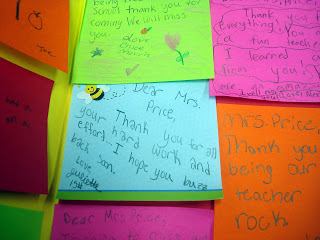 “I hope you buzz back soon.” And I hope Mrs. Price does “buzz” back soon! Even though she is an older woman, she has double my energy! Wow! 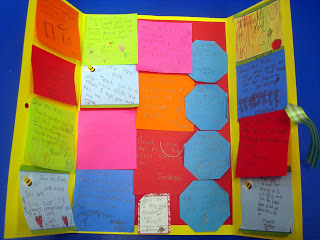 This is such a GREAT idea and a true time saver so I don't have to pass the thank-you card around one by one to each student. Thank you for sharing, and – more importantly – thank you for the great visuals! You inspired me. thank you!!! Awesome idea! Thank you for the post and visual.